Shipping: Most orders ship within FOB 3 business-days of placement. Orders must be received by 2 pm on any business day to count toward the three day shipping window. Premium shipping (Next-day, 2nd day air, etc) applies to the date the item is ready to ship. A minimal handling charge will be added to all shipments. Pricing: All pricing is in US dollars. Order Payments: All first time orders are check in advance, ACH, PayPal or credit card (American Express, Visa, MasterCard), if $3500 or less, otherwise an additional 1% charge will apply. -Custom orders: 50% down by check in advance, ACH, PayPal or credit card (American Express, Visa, MasterCard), if $3500 or less, otherwise an additional 1% charge will apply, with the balance due upon completion of the project. -Open accounts: Net 30 days for standard product. International orders: are payment in full via wire transfer before shipment. Credit Terms: Credit is at all times subject to approval and reviewed by our credit department. Late payments are subject to a 2% interest charge. Customer is responsible for all collection and legal fees associated with late payments. Property ownership will remain with IES. until products are paid for in full. Tax-exempt customers must supply a completed tax-exempt form before order can be processed. In addition to the general terms and conditions, the following shall also apply. For question regarding warranties, please request a copy of our warranty statement. Shipments received: Customer is responsible for unloading and package inspection of equipment, (customer to pay for any damages not noted on bill of lading). Order Cancellations (Standard Product): A 35% restocking fee applies to all non-custom product returns. All returns must be received in like new condition, in original packaging, with an RA number, within 15 days of purchase, to be eligible for a refund. Any item returned without an RA number will be refused. (Custom Product): Custom orders, software, shipping, handling, and rush charges are all nonrefundable. Warranty: All DC-Digital products carry a limited 1 year warranty (unless an extended warranty plan has been purchased) from the date stamped on the original product’s serial number (tampering of serial numbers will void warranty). The 1 year warranty covers only defects in operation of the electronics and LED,s produced by DC-Digital and that have been sold to the original purchaser (Second or third party owners voids warranty unless a new warranty period program is purchased by them). Switches, add-ons, and or third party connected devices are not covered under this warranty unless otherwise noted. Extended Warranties: A period of an extended warranty can be purchased on specific items and carry the same limitations as the original 1 year warranty (see above). Voided Warranty: The warranty is void if the end purchaser/user improperly mounts, connects inputs or outputs, or connects improper power that is not in accordance with instructions for that product or has improper or tampered serial numbers or improperly packaged for repair or does not have a proper RA or is a second or third party owner. Warranty Returns/Repairs: The original purchaser/user needs to contact DC-Digital 937-746-9750, 325 Industry Drive, Carlisle, Ohio, 45005 for RA , properly package and ship product. DC-Digital will not repair products that do not have a RA or are damaged in shipment or appear damaged do to improper packaging. After approval of warranty repair DC-Digital will return product using ground shipment only (one day or two shipments are not covered under normal warranty repairs but can be purchased). Repairs will carry an additional 1 year warranty from the date of the repair stamped on the serial number. Force Majeure: No liability shall result from any cause, (including without limitation Acts of nature, force majeure, labor trouble, inclement weather, shortage of or inability to obtain materials, equipment or transportation and/or orders of courts) beyond the reasonable control of the party affected. Either of us eliminates any quantities, so affected, but this contract shall remain otherwise in effect. If our supply of goods to be sold is limited by any such cause, we shall have the right to reduce or cancel in its entirety our commitment under this contract. Limitation of Liability: IES and/or its employees are to be held harmless and/or not responsible for any claims for accidents, death, dismemberment, or property damage as a result of improper installation, repair, and accidents on the job-site, equipment that is not installed according to manufacturer’s specifications or negligence by others. Payments on IES-Installed Local Products: Approved customers purchasing Scoreboards and Message Signs shall pay 1/3 of total invoice at time of order, 1/3 of total invoice at time of equipment arrival and the remainder as agreed upon completion. All custom products are non-refundable. Customer is responsible for unloading and package inspection of equipment. (Customer to pay for any damages not noted on bill of lading). Customer will provide clean electric to equipment and electric hookup. Customer will install all products unless otherwise noted in proposal. Please provide all required artwork in electronic format (Adobe Illustrator). vendor for all Ohio state agencies and ship our products worldwide. 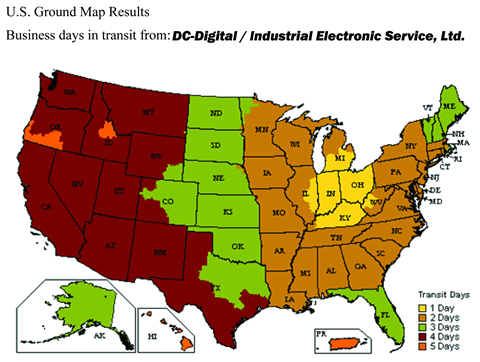 Let DC-Digital service your electronic timer, counter, clock, or number display needs today! Copyright 2017 DC-Digital | All Rights Reserved | Website - Returning the Gift, LLC.